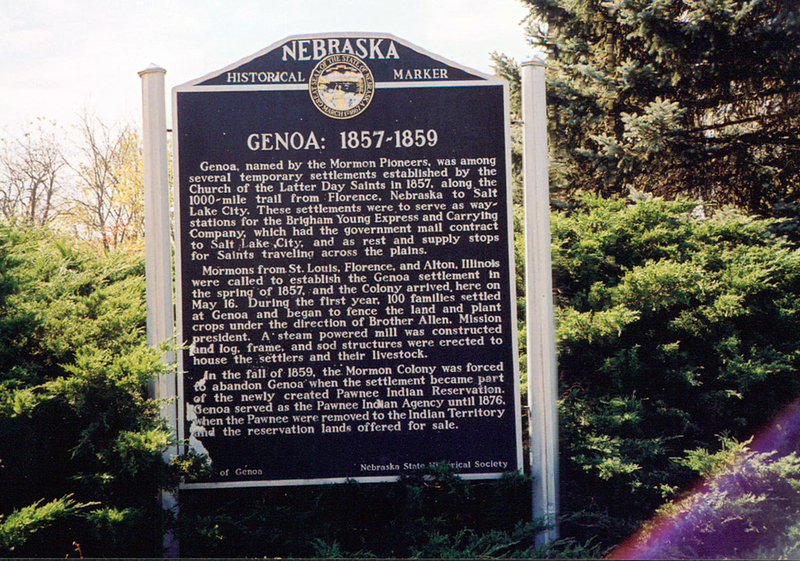 Genoa, named by the Mormon Pioneers, was among several temporary settlements established by the Church of the Latter Day Saints in 1857, along the 1000-mile trail from Florence, Nebraska to Salt Lake City. These settlements were to serve as way-stations for the Brigham Young Express and Carrying Company, which had the government mail contract to Salt Lake City, and as rest and supply stops for Saints traveling across the plains. Mormons from St. Louis, Florence, and Alton, Illinois were called to establish the Genoa settlement in the spring of 1857, and the Colony arrived here on May 16. During the first year, 100 families settled at Genoa and began to fence the land and plant crops under the direction of Brother Allen, Mission president. A steam powered mill was constructed and log, frame, and sod structures were erected to house the settlers and their livestock. In the fall of 1859, the Mormon Colony was forced to abandon Genoa when the settlement became part of the newly created Pawnee Indian Reservation. Genoa served as the Pawnee Indian Agency until 1876, when the Pawnee were removed to the Indian Territory and the reservation lands offered for sale. “Genoa: 1857-1859,” Explore Nebraska History, accessed April 19, 2019, https://mynehistory.com/items/show/369.